If you were skeptical about UFOs, you might have come away a believer on April 5. Early that morning, the Andøya Space Center in Norway launched two sounding rockets high into the ionosphere. As the rockets unloaded powdered trimethyl aluminum and a barium-strontium mix at an altitude of 200 miles (320 km), it quickly lit up and expanded into colorful blobs and streamers. Observers in Norway, many of whom were out watching the northern lights, couldn’t believe their eyes. Police received calls of an imminent alien invasion. Andøya Space Center / NASA Rocket launch – Azure Programme April 5th 2019 / Ole Salomonsen The scene gets really dramatic starting at 1:36. But the aliens were us. 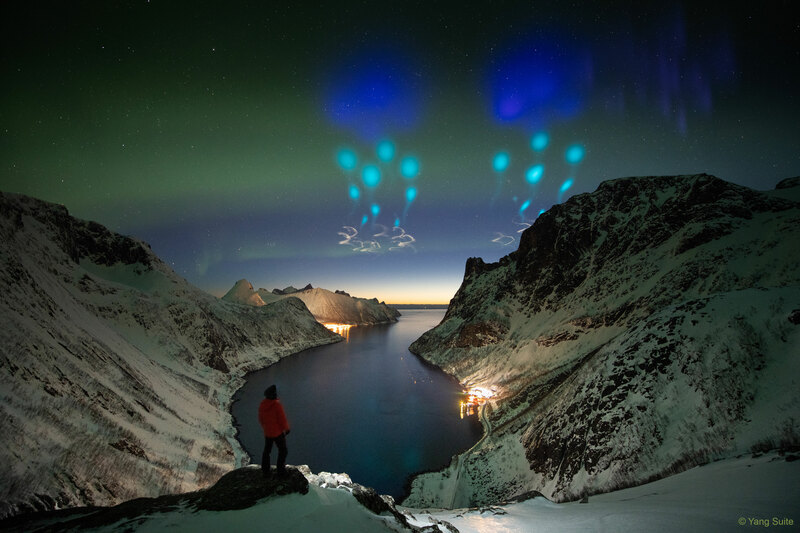 The experiment was part of the AZURE program (Auroral Zone Upwelling Rocket Experiment), a NASA-funded mission to study the E and F layers of the ionosphere where the aurora happens. During the day, the sun’s ultraviolet light ejects electrons from atoms in these layers in a process called photoionization. At night, with the sun out of view, the electrons recombine with the positively charged atoms. Ham radio operators use the E region (56-93 miles high) to bounce radio waves around the planet and talk to friends on the other side of the world. Scientists want to know more about the currents and winds flowing through these layers and how they affect astronauts, GPS signals and satellite communications. The aurora injects a lot of energy and heat into the upper atmosphere. The chemicals, which are harmless, light up like the aurora and reveal otherwise invisible flows and structures. Tri-methyl aluminum, which reacts with oxygen and luminesces, traces vertical winds in the ionosphere. Barium-strontium powder ionizes and tracks the flow of electrified and neutral particles. Since barium ionizes in sunlight with the observer in darkness to record the sight, the releases are done within a couple hours of local sunrise or sunset. Cameras on the ground record the whole thing. I wouldn’t be surprised if some of the photos taken by amateurs will also prove useful in scientific studies. Be sure you check this time lapse video of the display taken by a different photographer. Just amazing. One final bit. Tonight, the thin crescent returns to the evening sky. Look for the delicate thing low in the western sky about a half-hour after sunset. that is a beautiful picture can you share a higher resolution one? That’s the photo the photographer sent to me when I asked permission, so I’m not sure there’s a better one. I did downsize it a little but not too much.